From left: Jon Gunson, Mayor Eric Mamula, former town manager Tim Gagen, councilwoman Wendy Wolfe, Peter Joyce, Tim Casey, councilman Jeffrey Bergeron, councilman Mike Dudick, former Mayor John Warner, DJ Schappert, Megan Nuttleman and Bruce Fitch at the Breckenridge Outdoor Education Center's groundbreaking yesterday afternoon. 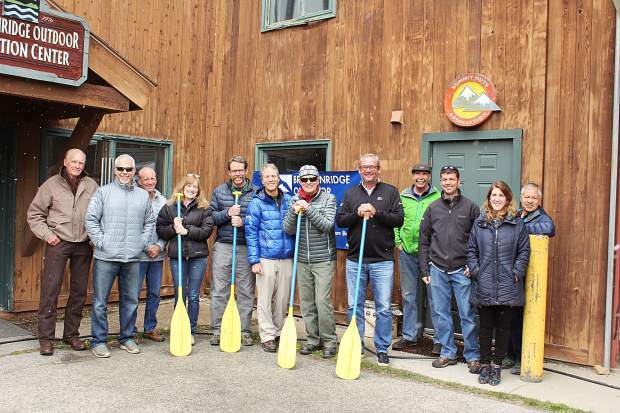 The Breckenridge Outdoor Education Center hosted a groundbreaking for their new Basecamp at the Sanitation Building on Wellington Street. The $2 million BOEC Basecamp project will add a third floor to the building that will provide housing for 16-22 staff members in the winter and summer seasons. The renovations to the four-decade-old building will allow for more storage space for the organization’s outdoor equipment as well as improved office space for their administrative and support staff. Executive director Bruce Fitch said that nearly $600,000 of the cost was in-kind donations by the Rockridge Building company as well as Custom Mountain Architects, who are helping to design and build the project. An additional $1.3 million was raised by donors. Construction on the building will be completed in the spring of 2018. The nonprofit has a lease with the town of Breckenridge for 50 years. The Breckenridge Outdoor Education Center serves nearly 2,500 people every year through their programming.